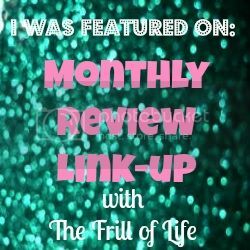 Tammy365: Co-hosting Excitement with Heather @ The Frill of Life! Co-hosting Excitement with Heather @ The Frill of Life! Please grab a button below and post in your linked up posts or in your sidebar. This will help our linky grow and get YOU more views! Follow your host (that's me) and your co-host in one form or fashion. Link up to 3 posts from September only. OR link up one post with links to your September posts within that linked post. 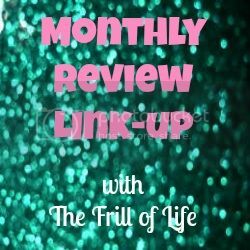 Give us a shout-out on Twitter using #MonthlyReviewLinkup and we'll be sure to see your posts! Check back next month to see if you're featured. We will feature four posts every month. If you are featured, feel free to grab a featured button and wear that baby with pride on your sidebar! If you'd like to co-host, email me! This month I'm thrilled to introduce Tammy from The Happy Handicap as my co-host! The question I hate. What is your niche? Truth is I don't have one. I love everything and most things make me happy. I can become passionate (in a hurry) on almost any subject. In my clumsy world you'll find blogs about almost everything and anything. I live life to "stay out of the box", please don't put me in one! Boxes are usually small, cramped and hard to breathe in. Since this is our first link up, I'm going to share with you 2 of my favorite posts that Tammy posted in September. As a fellow short girl, I really appreciated the post where Tammy talked about hugging short girls. I also enjoyed when she talked about How to Cook and Clean at the Same Time! It was really tough to just choose two posts. Tammy cracks me up every time I read her blog because she's so funny without even trying to be! Thanks for co-hosting my first link-up, Tammy! I will also highlight two of my own posts each month. Here are the two from September I want to make sure you don't miss! Biblical & Creative Correction was my most popular post ever, so if you haven't read it yet, go see what all the fuss is about. My Secret Ingredient Oatmeal Cookies were a hit over at Love, Pasta and a Toolbelt. Thanks, Emily, for letting me take over your space for a day! Now, let's party, shall we? Link up your posts below. I look forward to reading them all!